The mistreatment of Christians in the Middle East remains one of Pope Francis’ primary concerns, especially as the region remains engulfed in conflicts from Iraq to Syria and Yemen, according to the head of Iraq’s Catholic Church. Cardinal Louis Raphael Sako, Patriarch of Babylon of the Chaldeans and head of the Chaldean Catholic Church, told The National that Pope Francis is seeking to turn a page in Christian-Muslim relations as the UAE prepares to host the pontiff in his first ever papal visit to the Arabian Peninsula, which begins on Sunday. “Pope Francis is saying that this is enough. Let us live in peace, love, tolerance and to renounce violence and hatred,” Cardinal Sako said. During his historic trip to Abu Dhabi, the pope will promote interfaith dialogue and will seek to combat religious fanaticism. He will call for all faiths to evaluate the situation of Christians in the region and emphasize the values found in holy books for a peaceful co-existence between mankind. “The UAE has become a role model for other countries. It has a flourishing economy, our message to the Christians in the UAE is to hold on to that country, its traditions and to connect with Muslims,” Cardinal Sako said in a telephone interview to The National. The Cardinal confirmed that he will not accompany the pope on his trip. Iraq’s Christian population has faced significant persecution since the US invasion in 2003, declining from over one million to a few hundred thousand, a process that accelerated following the rise of ISIS in 2014. The group threatened to end their 2,000-year history in the country. “People should live and develop a personal, deep and spiritual bond with God away from hatred, separation and threats, which are not related to faith in any way,” the Cardinal said. Christianity in Iraq dates back to the first century of the Christian era, when the apostles Thomas and Thaddeus are believed to have preached the Gospel on the fertile flood plains of Tigris and Euphrates rivers. Today, Iraq has nearly 500,000 Christians, according to Cardinal Sako. “At one point Christians represented 6 per cent of the Iraqi population, but the number firstly dropped to 4 per cent and it now stands at 2 per cent,” he said. Under the insurgents’ rule, Christians were faced with a choice to convert, pay a tax or die. Many in the Nineveh Plains in northern Iraq chose to flee, seeking refuge in nearby towns and cities, but many sought permanent asylum abroad. The destruction has left many wondering whether they could overcome their recent history. “Christians in Iraq are searching for freedom, and this is painful,” he stressed. In recent years, Iraq has endured in a state of chaos, corruption, lack of security and good governance that has given a rise to armed militias that have threatened the country’s minority groups. “Christian homes were threatened, kidnappings took place,” he said. Although the country’s security situation has improved with the formation of a new cabinet, the status of Christians remains uncertain. “All this has driven Christians to believe that there’s no future for them and feel threats falling on their existence and belongings,” he stressed. Cardinal Sako expressed that this is not only a loss for Christians but also for Muslims, stressing that laws must be regulated and applied to every person who commits an offensive act. “Christians and non-Zionist Jews were slandered in some Friday sermons and in mosques, the Jews have a holy book and Christians too. They belong to this country long before Muslims,” he stressed. Iraq is home to many different eastern rite churches, both Catholic and Orthodox, traditionally a sign of the country’s ethnic and religious diversity. “We have co-existed in peace with each other for 14 centuries. I wonder why people’s mentality has changed,” the Cardinal said. The 70-year-old was born in Zakho in northern Iraq and has played a central role in interfaith dialogue in the country. 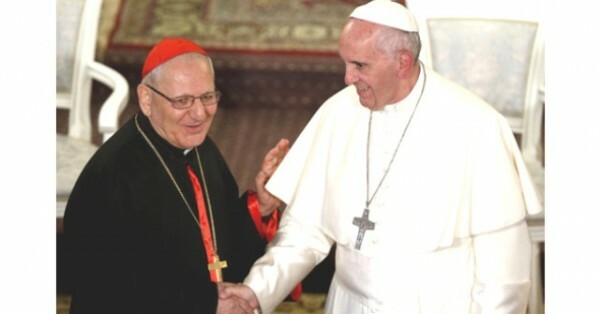 Cardinal Sako was elevated to cardinal last May by the pontiff in a move that was seen as a means to support Iraq’s declining Christian population. The College of Cardinals forms the senior ecclesiastical leadership of the Catholic Church, offering counsel to the pope and electing his successor. Cardinal Sako stressed that religion and violence are incompatible and called upon Christians and Muslims to contribute to building reconciliation in order to defeat extremism and violence. “The existing mentality is gruesome when people views each other as enemies and not brothers or neighbors. This mentality should change such and it can be done through education programs in schools, religious sermons and laws,” he said. The Cardinal has been tasked with forming a multi-faith dialogue committee including Christians, Sunni and Shiite Muslims to discuss ways to abolish hatred. “I am Iraqi, I can be a Christian or a Muslim or other. Whether I am a faithful person or not, this is between me and God. There should be justice in civil rights and equality should be implemented,” Cardinal Sako said. But with the pope’s visit to the UAE, the Cardinal is hopeful for a better future for Iraq’s beleaguered Christian minority.